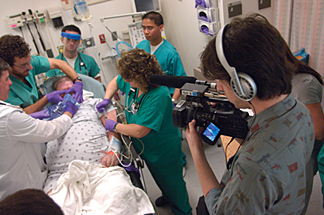 Behind the scenes of Hopkins, the ABC News series filmed at Johns Hopkins Hospital — where the author learned medicine. Blood. Guts. White coats. My husband and I are watching a new television program called simply, Hopkins. It doesn't escape our notice that the last time we paid this much attention to a hospital drama was during our first year of medical school. Then, we used to watch a brand new show called ER, keeping tally of how many times those pretend doctors said "STAT," the times they had romantic trysts with co-workers, the times they didn't wash their hands before or after seeing patients. ("After a rectal exam? Gross.") But Hopkins isn't scripted. These are real-life doctors acting out real life-and-death dramas. I'm amazed to see on TV the same emergency department where I had my first clinical rotation — with the same host of "Bal'mer" regulars: bloody gunshot victims, red-eyed drug addicts, the shrieking family members of the dead. A man in the waiting area drops his pants and flashes two female clinicians. "That happened to me in the Hopkins ED!" I remember. "Wonder if it's the same guy," my husband quips. When a surgeon refers to her nurse as "Miss Mary," I feel a warm rush of recognition. There were many Miss Marys in my Johns Hopkins education. The nurse who pointed at the correct instrument when the attending bellowed for me to "Retract, damn it!" The one who correctly positioned my hands on a laboring woman's body so that I could "catch" my first newborn. The one who taught me by gentle example how to comfort a mourning wife. But at the same time I loved the things I was learning at Hopkins, I hated the things I was learning at Hopkins. I hated the macho culture — how we called ourselves "marines," antibiotics "bullets," and chemotherapy "bombs"; how we high-fived each other when we discharged a patient, even an ill patient, off our floor. (Someone else's floor, someone else's problem.) I hated how, before a particularly awful procedure, we would tell a patient, "This is going to hurt you more than it hurts me." I hated how, afterward, we would say, to ourselves and our patients, "That wasn't so bad, was it?" As a daughter of a non-medical, immigrant family, who studied more literature than biology in college, there were times I thought of quitting medicine altogether. A young Indian American medical student appears on screen. Although she could be a younger version of me, she's better at talking the Hopkins talk. "On my first day of E-med, I got to I and D — which is incision and drainage — an abscess on a guy's head," she reveals, grinning slightly ghoulishly. "Like this huge, red abscess, and I got to slice away at it. . . . That was really cool." Medical training is, of course, cool. It's an initiation into geographies of the human body and soul otherwise forbidden to mere mortals. If that's not the definition of cool, I don't know what is. But like induction into all forbidden cults, medical training can come with a serious price: a numbing to pain, a distancing from those we seek to heal, a learned matter-of-fact-ness about the most awe-inspiring experiences. Among all the tests and rituals, the long nights and shattering humiliations, my saving grace was that I also met my husband at Hopkins. It happened, naturally, in Anatomy Lab — among body bags, the cloying smell of formaldehyde, amid scalpels and forceps and dissection guides stained with human blood and tissue. There, amid all that death, we fell in love. Unlike the grotesque humor that many medical students develop to help inure the psyche to the violences we commit — on dead bodies, on live patients, on ourselves — falling in love during medical school helped me hold onto my sense of self before medicine. It was like having my own invisible hot air balloon, a mechanism to float, at least for a while, high above the gravity of what it meant to be a Hopkins doctor. Tonight we watch the story of a 2-year-old being treated for heart failure at Hopkins. Unexpectedly, in the middle of a sedated MRI procedure, the baby turns a bright green shade of blue. He is in cardiac arrest. I have been in these life-and-death situations before, but watching it on screen makes this somehow more intimate and heartbreaking. I am awash, on the edge of my seat, while the Hopkins doctors quite literally perform miracles. My chest explodes with joy and gratitude when the baby finally receives the heart transplant, and recovers. Our own baby cries suddenly from the next room. My husband brings her back to snuggle peacefully between us. She sighs in her sleep, blessedly healthy. In the end, the way other couples might think fondly of the restaurant or gym where they first met, Hopkins is our place. It was there that we began this good life together, under that iconic dome, in that place of chaos and hospital hierarchy, of daredevil medicine and miraculous cures, of life and death and the outer limits of human possibility. In watching the stories of where my medical career began, I am reminded of how I became not just the doctor I am, but, in all senses of the word, me. This is where I heard my first patient's story, where I touched, for the first time, a body in pain. This is where I learned how a man looks at a woman he loves, where I first touched his body and was touched in turn. This is where I discovered life's undulating pattern of systole and diastole — that joy and grief, love and disease, life and death are separated from one another by the most transparent of membranes. This is where my adult heart learned to beat. Sayantani DasGupta, SPH '97, Med '98, is assistant professor of clinical pediatrics and core faculty in the Program in Narrative Medicine at Columbia University. She is author of a memoir, called Her Own Medicine, about her education at Johns Hopkins; more recently, she co-edited an award-winning volume of women's illness narratives, Stories of Illness and Healing: Women Write Their Bodies.